The simple way to understand (and learn) Chinese. 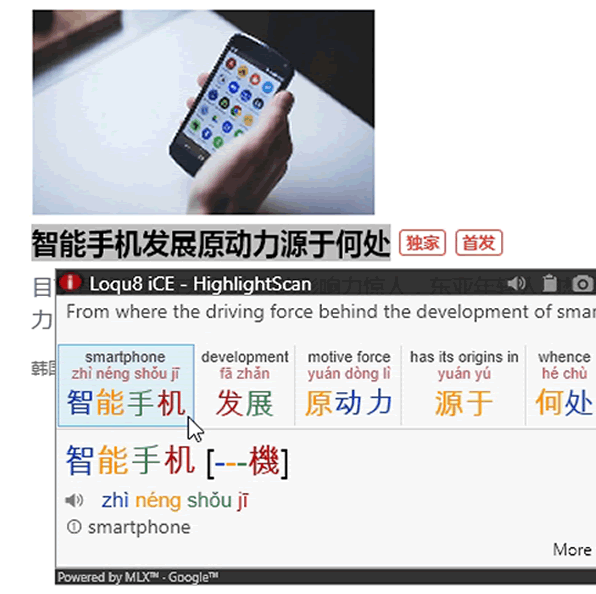 Loqu8 iCE is a powerful tool for understanding and learning Chinese. Traditional learning programs that use repetitive drills and silly matching games may be helpful for younger children, but learning experts agree that adults learn differently. Loqu8's powerful augmented learning techniques let you choose what to learn and when to learn it. Take control of your time by focusing only on what's important to you. Understand and translate Chinese directly in your emails, documents and web pages. 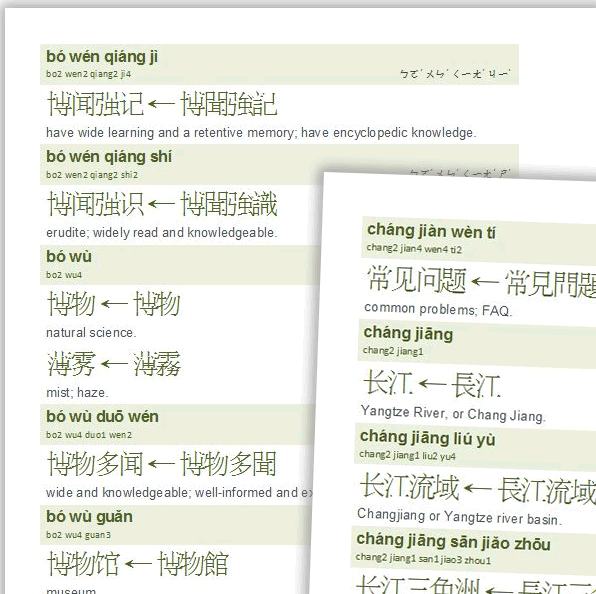 Lookup words, names, products and idioms in any combination of English, Chinese or Pinyin. Listen to crisp pronunciations or speed up to practice conversational Chinese. Louq8 iCE is available in four editions to fit your needs and budget. 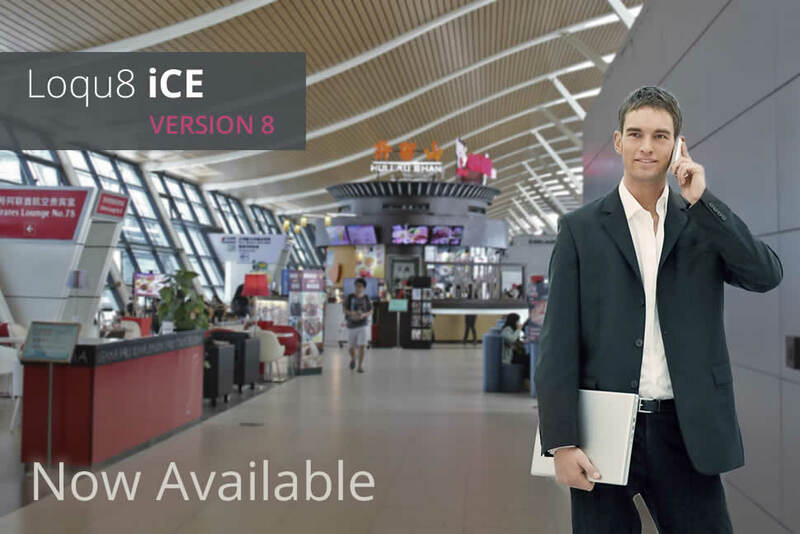 Loqu8 iCE Ultimate Edition is ideal for business professionals and serious learners: a total of three premium voices (including Cantonese) and three premium dictionaries are included. With the capacity to manage up to 100 personal dictionaries, professional translators and scholars will have the flexibility to easily work with multiple documents and clients. Handling a high volume of Chinese text? Ultimate users will appreciate the 50,000 translation credits per month. Priority technical support is also included with every Ultimate Edition package. Select Chinese text and see what it means. Dictionary lookup in any combination of Chinese, English and Pinyin. Auto-Translate with Google (up to 89 languages) and Microsoft (up to 49 languages). WebTranslate with Google and Microsoft. Click to pronounce. 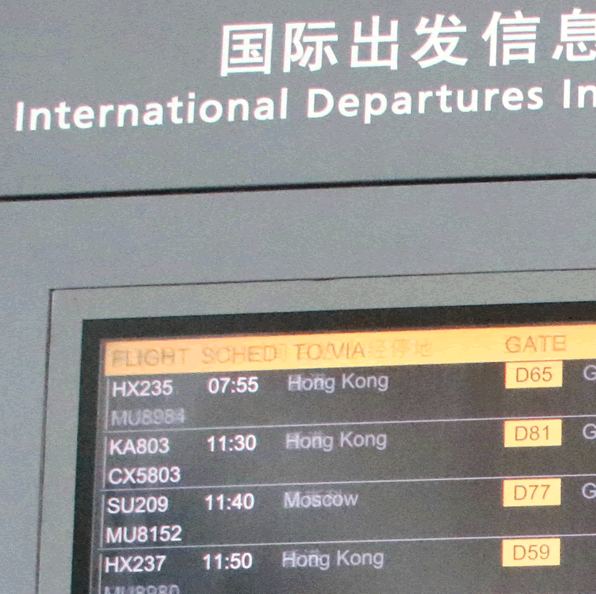 Auto-Pronounce reads words aloud in your choice of 3 Premium Mandarin and Cantonese voices. Adjust pauses between words. 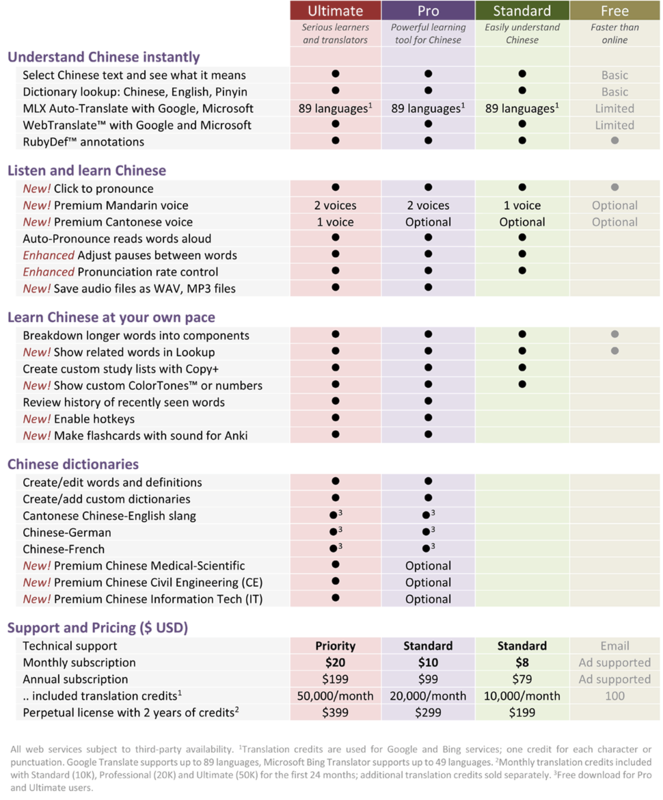 Slow voice rate control to hear pronunciation nuances or speed up to practice conversational Chinese. Breakdown longer words into components. Show related words in Lookup. Create custom study lists with Copy+. Show custom ColorTones or numbers. Review history of recently seen words. Enable hotkeys. Make flashcards with sound for Anki (for iPhone, Android, Windows). Add your own custom definitions and usage notes. Share your definitions with others. Premium dictionaries: Chinese Medical-Scientific, Chinese Civil Engineering (CE) and Chinese Information Technology (IT). Professional dictionaries: Cantonese-English slang, Chinese-German,	Chinese-French. Auto-Pronounce reads words aloud. Adjust pauses between words. Receive priority support for Loqu8 iCE Ultimate Edition. Live communication options include chat, remote access, email and phone. Glide your mouse over Chinese text in your email, document or website. 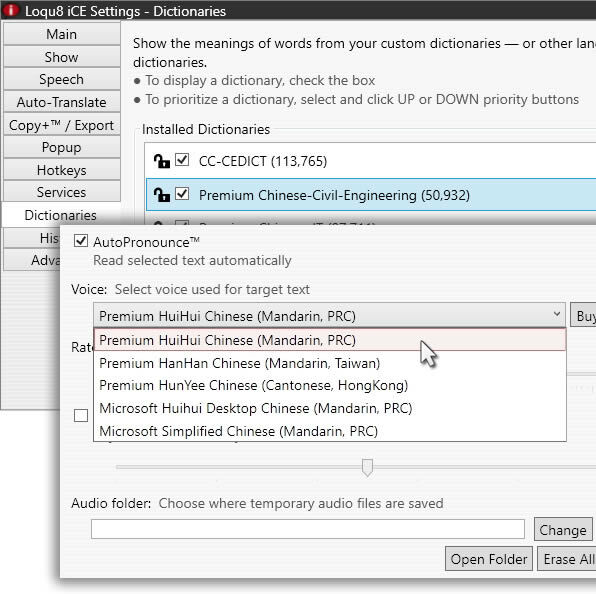 Loqu8 iCE Professional Edition responds intuitively with dictionary-based definitions and auto-translations. In seconds, you’ll gain an understanding of Chinese text faster and more efficiently than any translation or dictionary website. Select Chinese text and see what it means. Dictionary lookup in any combination of Chinese, English and Pinyin. Auto-Translate with Google (up to 89 languages) and Microsoft (up to 49 languages). WebTranslate with Google and Microsoft. RubyDef annotations. Add your own custom definitions and usage notes. Share your definitions with others. Professional dictionaries include: Cantonese-English slang, Chinese-German,	Chinese-French. Auto-Pronounce reads words aloud. Adjust pauses between words. 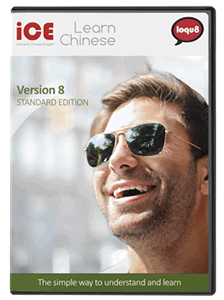 With Loqu8 iCE Standard Edition, understanding Chinese is simple: just point or highlight text with your mouse. In moments, you'll understand the meanings of over 113,000 Chinese words, names and idiomatic phrases. 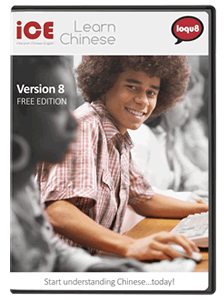 Since this Chinese-English dictionary is installed on your computer, it's always available--even when your Internet connection is slow or unavailable. Click to pronounce. Auto-Pronounce reads words aloud in Mandarin. Adjust pauses between words. 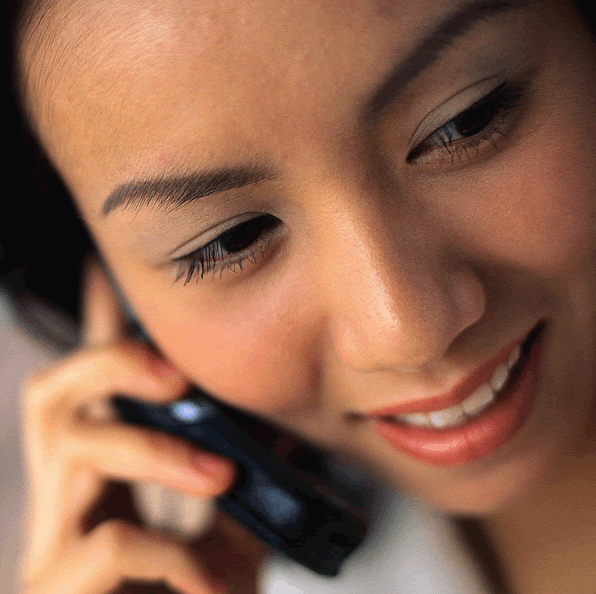 Slow voice rate control to hear pronunciation nuances or speed up to practice conversational Chinese. Breakdown longer words into components. Show related words in Lookup. Create custom study lists with Copy+. Show custom ColorTones or numbers. 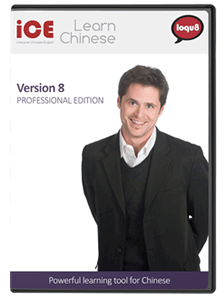 The Free Edition of Loqu8 iCE is a good introduction to the Chinese language and culture. Here's what's available. Select Chinese text and see what it means from your favorite browser: Google Chrome, Microsoft Edge/IE or Mozilla Firefox. Dictionary lookup in any combination of Chinese, English and Pinyin. Click to pronounce and hear words read aloud.